Pet Samaritan Clinic’s experienced support staff strive to provide personalized, compassionate care for our patients and clients alike. Jennifer is a true Portland native. She was born and raised in the Laurelhurst neighborhood. Jennifer has always had a passion for animals. 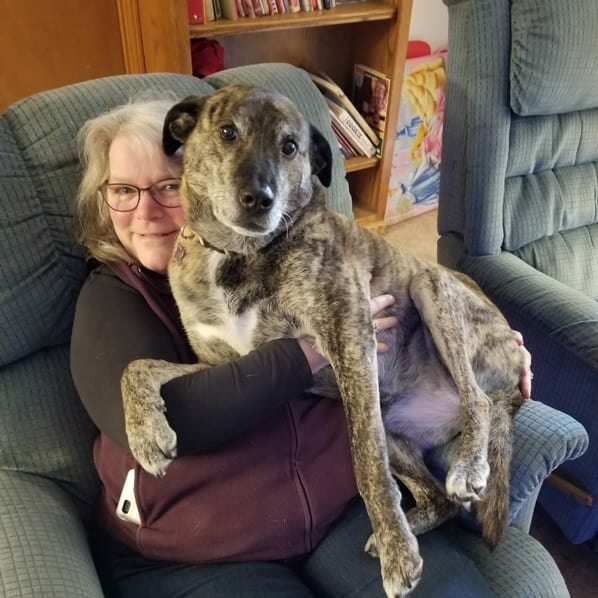 She became a client of Pet Samaritan Clinic in 1992 with her first true love- (a rescue from Oregon Humane Society), her Golden Retriever mix by the name of Lady. 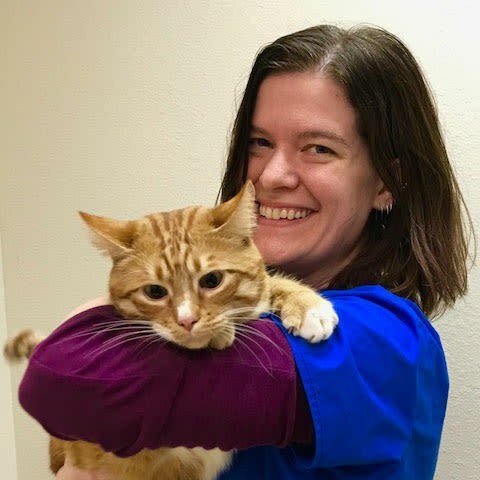 Growing up as a child and young adult Jennifer always dreamed of working at Pet Samaritan Clinic. In elementary school she wrote a report on animals and caring for them. In the report, she stated that she hoped to one day work at Pet Sam. In 2003 that childhood dream came true, she was hired on as a receptionist and has since moved her way up and is now the Hospital Manager – with her report hanging proudly in the lobby on display. She keeps herself busy with her two daughters, husband, their Great Dane –Cooper and their Munchkin cat – Snickelfritz. When not at the clinic, Jenn and her family enjoy going to the lake, spending time with friends and family and traveling. Jennifer takes pride in the history of Pet Samaritan Clinic. She is ecstatic with the amount of passion and care that her staff gives to both the animals and their owners. Ashley was born and raised in the California bay area. She moved to Portland in 1992. She always dreamed of working at a veterinary clinic. When she moved to Portland she asked her sister who was already working in the field, who was the best veterinarian in Portland. Her sister replied, “Pat Huff” at Pet Samaritan Clinic. Ashley got her chance at Pet Samaritan Clinic and worked there for the next 19.5 years, working closely with Dr. Patricia Huff who became her mentor. Ashley worked in every facet of the clinic over the years; she also raised her two sons at the clinic. She has been very active in animal rescue and an advocate for the homeless and their pets. After Dr. Huff passed away Ashley decided to fulfill a promise she had made to Pat and finish her college education. She left Pet Sam for 5 years to peruse her schooling and received her bachelors of Art from Marylhurst University. 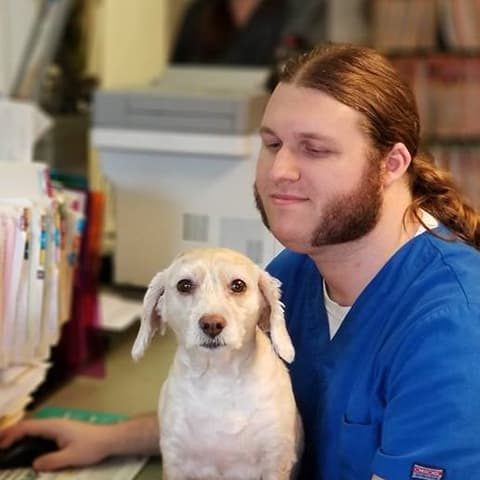 Ashley has returned to Pet Samaritan to work as the Assistant Hospital Manager. She now lives in Portland with her childhood best friend and now her husband Dennis, between the two of them they have 2 sons (Jonah and Myles) and 2 daughters (Isabella and Liliana). She has 3 beautiful grandsons - Cash and his twin brothers Jaxson and Jesse. Her household also is home to 4 cats ( Nathaniel Hawthorne DePauw, Tiny Chuck Biscuits, Tiny Lord Valentino and Kit Harington) and 2 dogs ( a yellow lab named Fly and a Boston Terrier named Boone). Plus they have 2 really old goldfish! 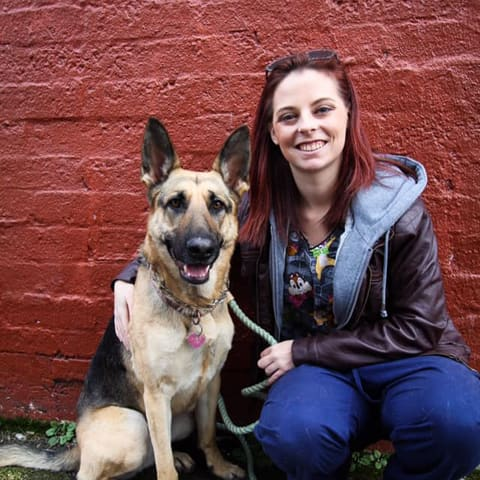 Come in and meet Ashley, she is one to make you and your companion feel part of the Pet Sam family. Jammie is a local Oregonian, born and raised in our local area. She formerly worked as a receptionist at Pet Samaritan Clinic from 1997 – 2000 and we are so happy to welcome her back. Jammie lives in Gresham Oregon with her partner Will and their two sons Wiatt and Isaak. They have a super cool dog named Red, a kitty named Jingles, a Doodle named Eli and her betta fish collection. When Jammie’s not at Pet Samaritan she loves adventure, exploring Astoria or even a good float in a lake. Jammie loves art, scavenging at garage sales, and repurposing items. She is a bloody mary aficionado; she likes strong coffee, food carts, outdoor concerts, old classic chevys and pie! Nicole is a Northwest native, raised in Vancouver Washington her whole life. 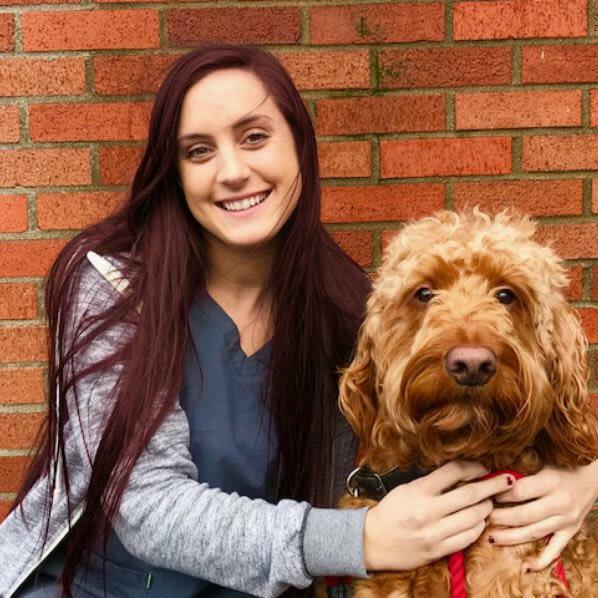 Nicole has a great deal of veterinary experience, first working at a veterinary clinic in Pullman Washington while attending Washington State University. She became a receptionist at Pet Samaritan in 2016. She loves working with animals and their people. 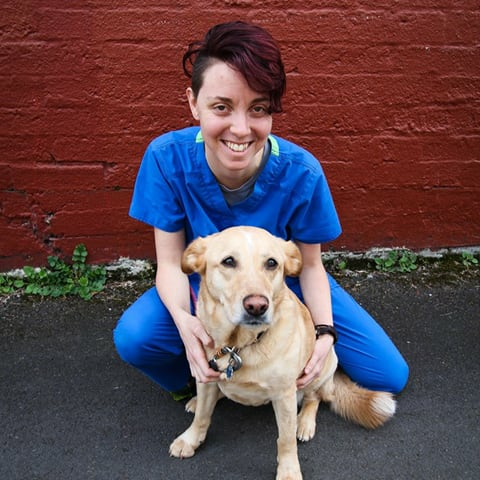 Nicole has a passion for all companion animals, she has a special interest in training and the Fear Free Veterinary experience. She currently has 4 pets - a Goldendoodle named Tucker, a cat named Saylor, Pomski named Grizz and a beta fish. Nicole and her pups spend their time hiking, doing dog agility and exploring the Pacific Northwest. Danielle is an Oregon native, she was born and raised in Gresham Oregon. Growing up with German Shepherd Dogs and horses she has always had a passion for animals. After high school she moved to California where she started her studies in Veterinary science, she started working for a vet hospital there. She realized her calling was in helping animals and their people. She has since moved back to Gresham with her beautiful daughter Evelynn and her German Shepherd Rogue. She came to work with us at Pet Samaritan and will continue her studies to become a certified veterinary technician. In her time off Danielle enjoys exploring the outdoors with her daughter and dog or relaxing at home. She loves coffee and is always on the look out for new flavors. She loves working out, fishing and horseback riding. We are so happy to welcome Danielle to our team. Marielle is currently a veterinary technician student at Portland Community College working to get her vet tech certification. She is interested in studying wildlife rehabilitation. 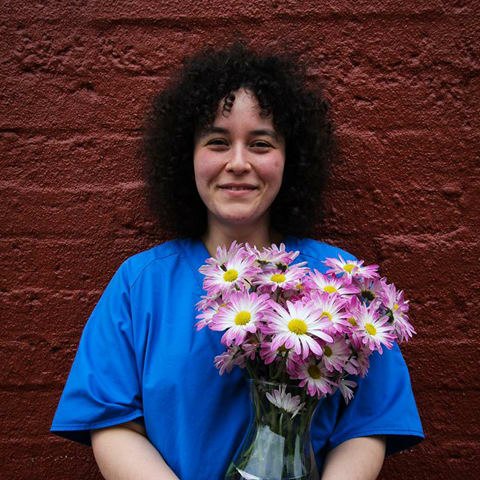 Marielle first worked at a grooming salon in South Carolina and realized she wanted to make a life working with animals. She was born and raised in New Jersey and moved to Portland three years ago. 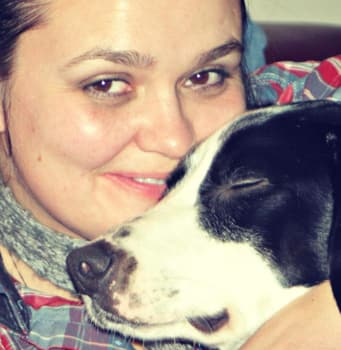 Marielle loves spending time with her rescue dog, a sweet, goofy American Bulldog named Droopy. She adopted Droopy from local Agave Dogs Rescue. She loves the outdoors and exploring Oregon. We are so happy to have Marielle as part of the Pet Sam family; she currently works as both a receptionist and a technician. For thirty five years Deb worked in restaurants. Serving for the most part, but also filling in as a cook or baker when needed. In 2009 Deb began working in an assisted living center, running a coffee shop there and filling in as needed in the kitchen, or at the front desk. For the last five years, Deb has been babysitting her granddaughters...and a handful of other little ones. This year, the granddaughters will be in school all day....and it's time for "Ma" to move on to a new position with Pet Samaritan Clinic - helping out in anyway she can for her daughter the Hospital Manager. Come in and meet Deb… her warm smile and just genuine happiness for life and animals can be most comforting on the roughest of days. Sophie started at Pet Sam as a Receptionist in 2015, and is now a working as our Head Technician. Not only is she a great Vet Tech she is skilled as a pharmacy technician, inventory clerk and receptionist. Sophie is certified in Phlebotomy and great at drawing blood. 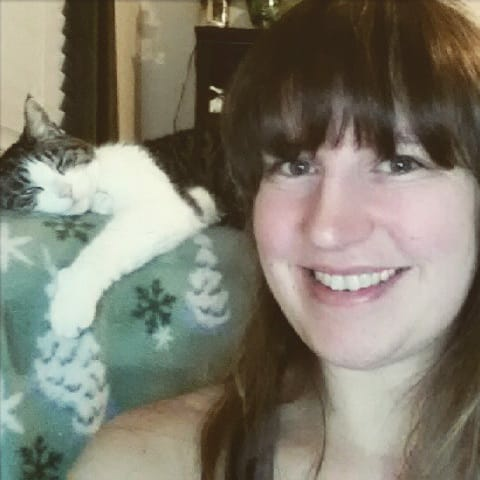 She loves working with animals, and has now collected 2 cats living with her at home since starting work at Pet Sam. She loves to spend her spare time with her kitties Janeway and Geordi. She adores Harry Potter and is an avid fan. 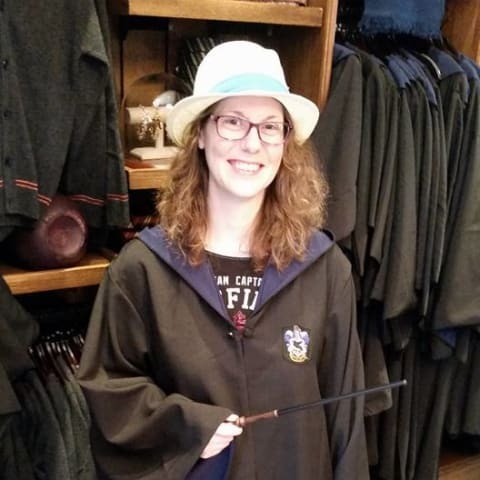 She is Ravenclaw all the way! Gwyn is from Davis California, she moved to the Portland area in 2000. She is currently studying at Portland Community College to get into the Veterinary Technician program. 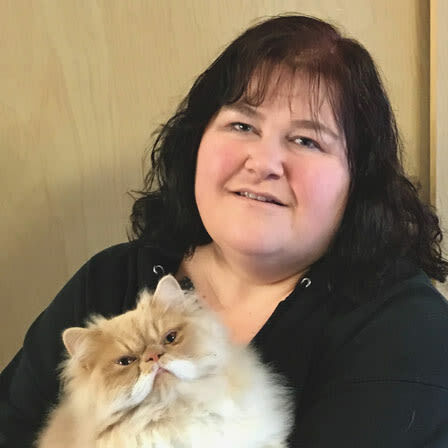 Gwyn started as a technician at Pet Samaritan in October 2017 after being a long time client. She likes to do black and white film photography and knit. She is a beer connoisseur; she loves to taste new flavors and brews. She and her husband have three cats, Zarkov, Flash Gordon and Psycho. We are very happy to have Gwyn as part of the Pet Sam team. Lee was raised in Wisconsin was active in FFA and showed cows and worked on a dairy farm for 7 years. He attended the University of Wisconsin Platteville for his Bachelors in History. He then attended graduate school at the University of North Dakota and got his Masters in History. Lee moved to the Portland area in 2012 and worked in a laboratory setting before he came to Pet Samaritan to be a technician. Lee is very much a dog person and has an amazing dog named Sadie. Lee grew up with Golden Retrievers, and he helped train bird hunting dogs. Lee currently resides in Gresham Oregon with his dog, his cat Nala and his wife Aubree. Lee enjoys playing hockey, hiking and playing video games. He is friendly and outgoing and an asset to our tech team. Megan grew up in a small town in Indiana, where she attended school to become a veterinary technician. After graduating and working 5 years in emergency medicine, she packed up and moved to California with her fiance, Christopher. They spent 3 years in SoCal where Megan worked in a holistic clinic, and found a new passion for animal massage and reiki. Last August, her and her long time best friend, Christopher,got married on Lincoln city beach. They loved the area, and the people reminded them of home, so they decided after his grad school was done they would move to Portland. 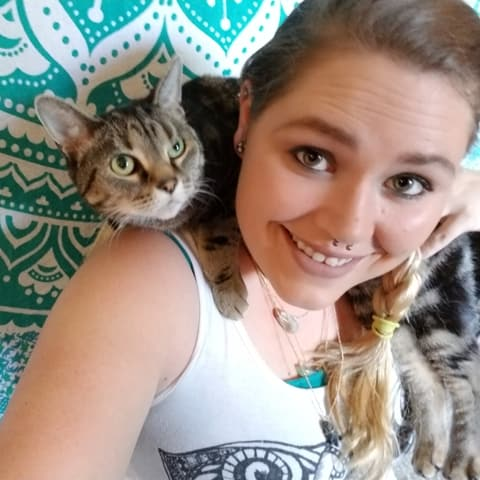 Megan Hope's to attend classes at Northwest animal massage college, and continue her love of helping animals in her new home at Pet Samaritan Clinic. 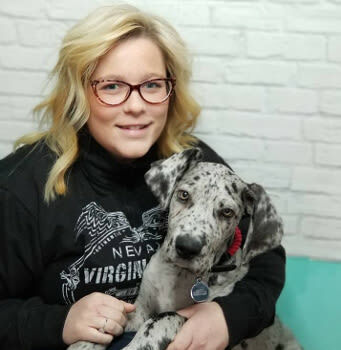 Megan is currently learning more about the Fear Free Veterinary movement and hopes to implement those skills at Pet Sam, which we are very excited to participate in. Lauren is a recent transplant from the sunny pine savannas, shady bayous, and rich cultural heritage of Louisiana. 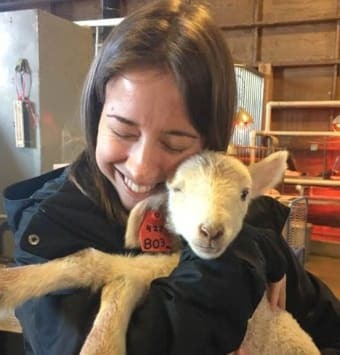 She has over seven years of experience in the veterinary field and animal sciences, working a a veterinary technician, zoo keeper, and as a farm hand. Lauren and her dog Opal love to travel and have explored the deep south, Appalachia, and now the Pacific Northwest. When not at the clinic, Lauren uses her M.S. in Geography and B.S. in Ecology to teach youth and adults about the wonders of the natural world and how people connect with it. Lauren is enthusiastic about goats and adventures, and is excited to join the Pet Samaritan Team.